It’s also known as “averaging down” or “averaging up”. 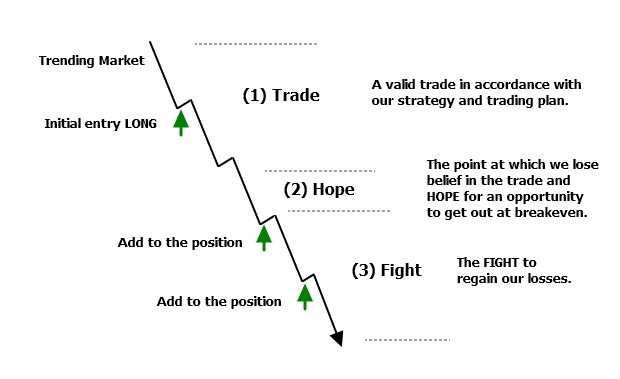 There’s a story about a wheat trader who was sure he was right that wheat was going to fall and he kept averaging up. USD$20m, a house, a wife and family later, he was out of the game. 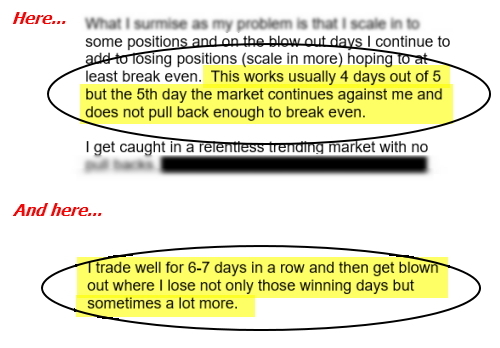 Yes, it doesn’t matter how many times that strategy has worked for someone, they’re only ever one long-extended drawdown away from blowing up and losing everything. USD$20m, a house, a wife and family – that is one serious loss. As they say, the best loss is always the early loss. Well before it gets out of hand. The following is an absolutely brilliant comment on this article, which I received by email. I have shared this in the hope that others may also benefit from it. 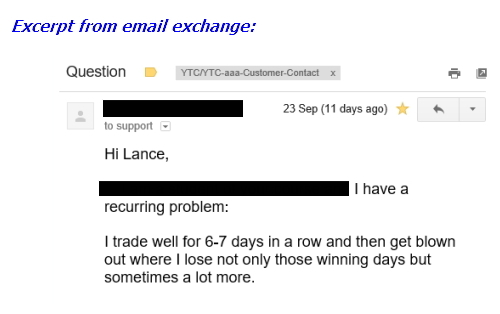 I had a terrible problem with averaging down on losers just like your article this weekend. For the very same reason; i got away with it 9 times out of 10. I eventually came up with a solution. First: why was I doing it? 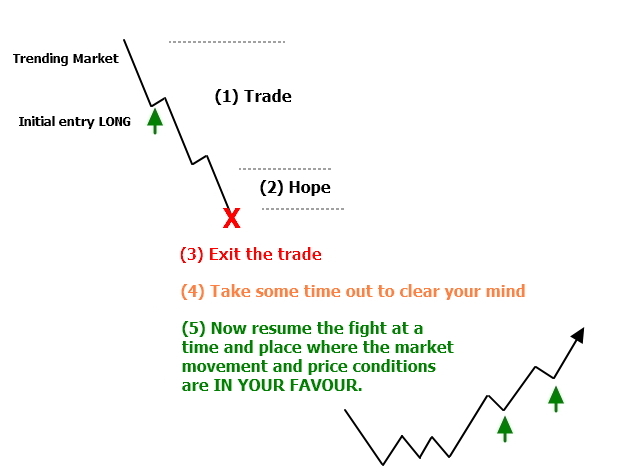 – Obviously to avoid having to take a loss. So why not just stop out when the loss is very small? – because of fear that it will reverse and I’ll miss out. Why will I miss out if it reverses? – because I didn’t have a good plan to re-enter, either in the same direction or reverse. Once i was able to see that I was averaging down due to a flaw in my technique, I was able to fix it. 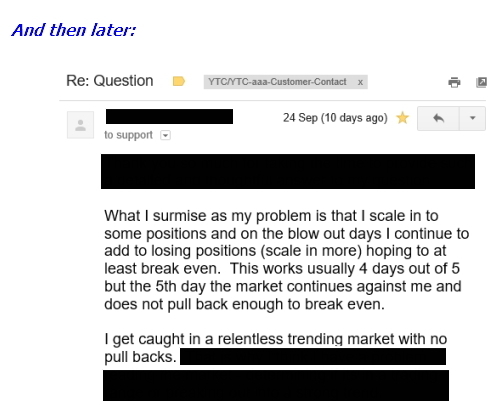 Now i trade all-in, all-out. 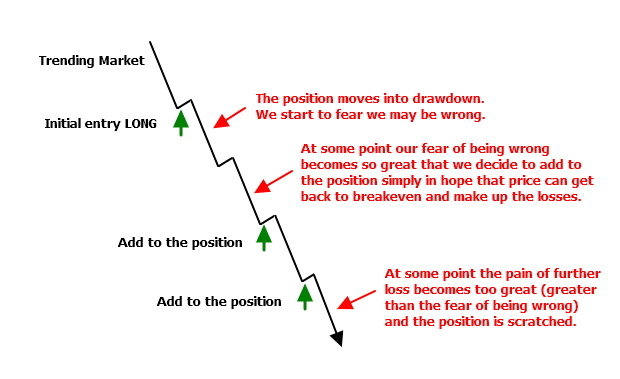 Scaling in, and even scaling out ensures that you will have the largest position size on your worst trades & the smallest position size on your best ones. Absolutely opposite of what it should be. Scaling in also caused me to be sloppy with my entries. I would enter to “test the waters”, thinking that if it wasn’t the right entry, I would just add at a better price. Now I choose my entries with a surgeons precision and am ruthless at cutting them off very quickly. All because of one little missing piece.